Last week's magnitude 7.0 earthquake near Anchorage caused multiple problems at the sprawling Joint Base Elmendorf-Richardson, including damage to steel frameworks, ceilings, and sprinkler and heating systems. ANCHORAGE, Alaska (AP) — Last week’s magnitude 7.0 earthquake near Anchorage caused multiple problems at the sprawling Joint Base Elmendorf-Richardson, including damage to steel frameworks, ceilings, and sprinkler and heating systems, military officials said Friday. 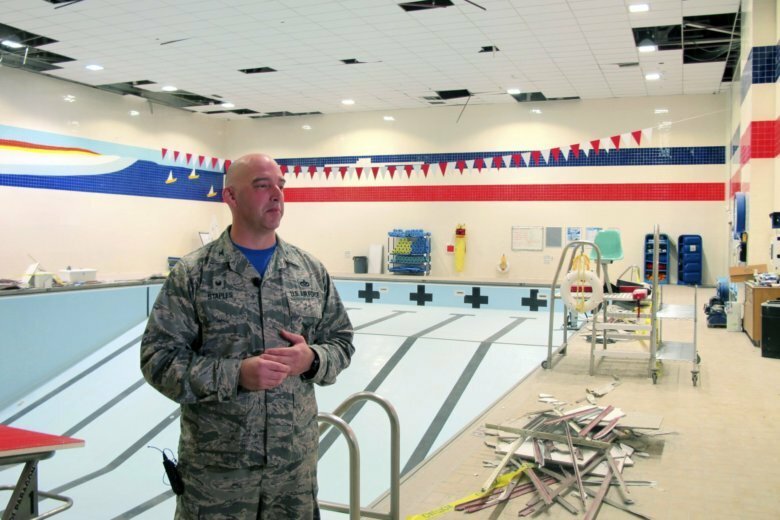 Base officials unveiled damage to a swimming pool room in a base fitness building during Friday’s briefing. Ceiling panels were still missing, and the floor near the empty pool was littered with debris. The building is among several that remain closed at the base. The 123-square-mile (319-square kilometer) base, located on Anchorage’s north side, is home to about 1,000 buildings, plus another 3,200 housing units. Only one household was displaced, and that was because of a water outage. The base has provided emotional support to those who need it, said Col. Michael Staples, commander of the 673D Civil Engineering Group. “The chaplain has been very busy,” he said. The main earthquake damaged structures over a wide swath of the temblor’s impact zone area in Anchorage and beyond, disrupting power and cracking roads.